The Green People Oy! Organic Young products have long been a staple skincare range for young and teenage skin that is susceptible to acne and/or congestion. Recently the range has been given a new look and I was lucky enough to receive the new and improved selection to test. This couldn't have come at a better time as I have recently been dealing with a flare of cystic acne along my chin and jawline. 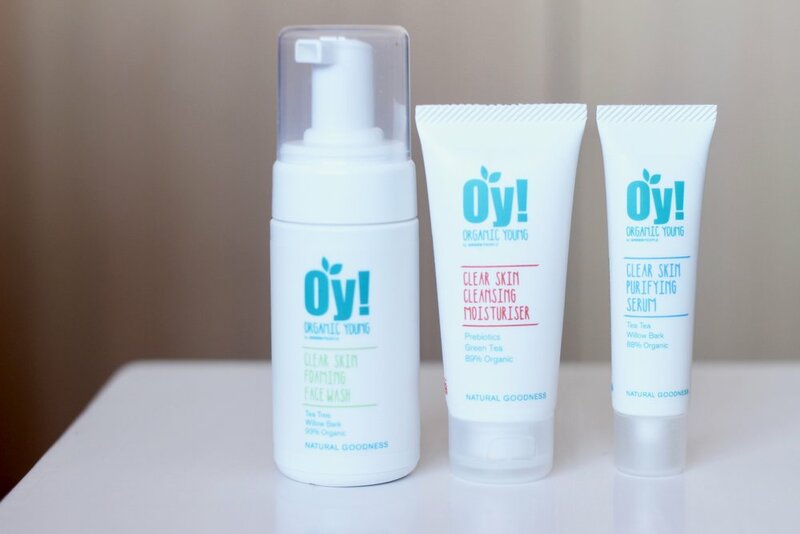 I was also sent the Organic Young deodorant* but today I shall be focusing on the Clear Skin Foaming Face Wash*, Clear Skin Cleansing Moisturiser*, and the Clear Skin Purifying Serum*. I have already mentioned the Clear Skin Foaming Face Wash* in my recent skincare routine update and I have been continuing to use it over the weeks since. Unfortunately, this is still probably my least favourite product. I am unsure whether it is just because I am used to more active formulations, but I don't feel that this actually does much for my skin. I like a foaming or gel cleanser to be slightly resurfacing (via chemical exfoliations like salicylic acid), and although this cleanser contains willow bark extract, I don't think it is strong enough for my hardy skin type to have much effect on my acne or clogged pores. However, saying that, it does make my skin feel wonderfully clean and soft and so I still like to use it on my skin in the shower - for example after I have been working out or when my skin doesn't require a more thorough cleanse. The very light texture is also very pleasing when you are all hot and bothered, and it would be great during the summer months. I'm don't sure whether I have given the Clear Skin Purifying Serum* a fair run as of yet but it reminds me of more conventional spot treatments but with of course, far more natural ingredients. 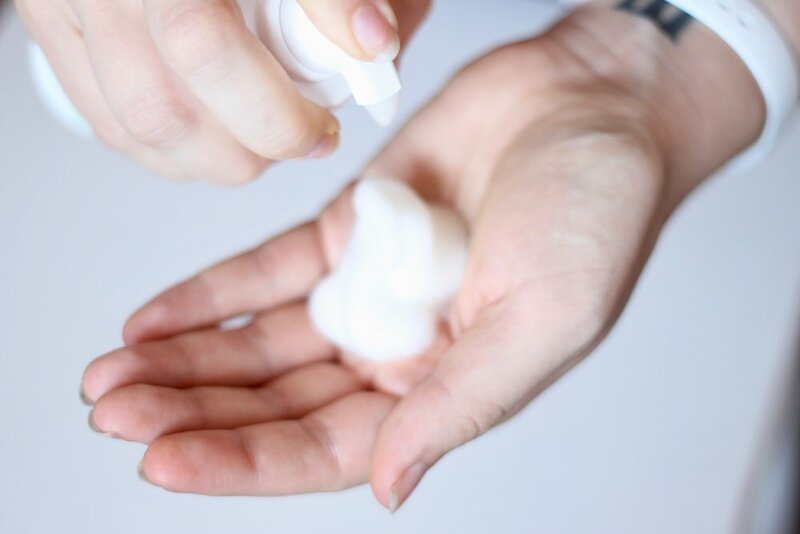 Like many of the acne serums I have tried, I find this to be more cooling and soothing than it is healing, but this is very welcomed when you are dealing with red and painful cystic acne. My favourite product of the lot has to be the Clear Skin Cleansing Moisturiser*. If you have been reading the blog for a while, you will be aware that I am a massive fan of Green People's Beauty Boost Skin Restore and really enjoy it as a daytime moisturiser. This Clear Skin Moisturiser really reminds me of that product and if you have found the former to be a little heavy for your skin, this may be a good alternative. It's lovely and light while still being moisturising enough for skin that may be a little dry from acne-fighting active ingredients. It sinks in quickly and sits perfectly under makeup. I've been reaching for it on a regular basis when I know I'm going to be spending most of the day inside. As much as this product may benefit from its own SPF, I appreciate the flexibility that is afforded by it being left out. When skin is angry, a solid, simple routine is required and the lack of SPF means that this product can be used both day and night. I feel that this is especially important within a range aimed at younger people as there isn't always the budget for a more expansive skincare collection. The entire Oy! range is great value for money and although cheaper options can be found on the high street, it's definitely a more accessible range within the green/natural beauty sector. Overall this range is a triumph in terms of making cleaner beauty more accessible to younger people, both in its value and its likeness in feel to more conventional products on the market. Definitely one to consider if you're looking to introduce a younger family member to green beauty - but also a fantastic range for anyone of any age with skin that is prone to acne and similar issues.